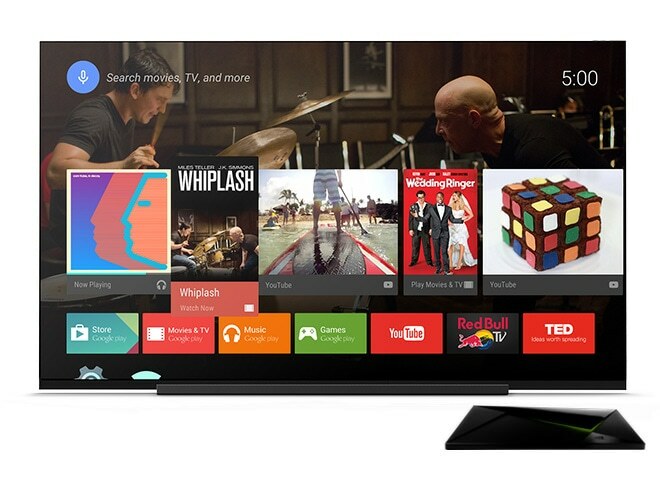 Android TV is Android designed for TVs (almost self explanatory). This means you can run any Android app on your Android TV device, kind of (more on that later). It’s a relatively streamlined experience for watching videos, listening to music, and playing games. Though, if you dig under the hood a little, you can set up a really powerful experience. For context, I have been using a Nvidia Shield TV (2017) for a few weeks now. It’s definitely the most high end Android TV device there is. Though I didn’t run into performance issues, I can’t say every TV device will be fine in that regard, so keep that in mind. This was very simple. Once you connect up power and HDMI to your device, it’s just like setting up a smartphone. Connect to the internet, sign in to an account (or don’t), and load up to a home screen with some pre-loaded apps (that you can’t uninstall…). Speaking of home screens, Android TV’s home displays a list of rows with suggested content, apps, games, and settings. It looks nice and is responsive. Unfortunately the suggested content can be really inaccurate, and though you can hide suggestions from all your sources, it doesn’t get rid of the row on your home screen. You also can’t set the background image, which is something Android could do since 1.0 (though you do have some choice with screen savers). Google Play provides a decent selection of applications that have a UI meant for a TV. It essentially covers any video and music streaming application you could want (which is awesome), and then a good number of games. Unfortunately, you can’t download non-TV compatible apps from the play store, but you can sideload them! All you need to do is enable installations from unknown sources, install your desired app via apk file, grab the Sideload Launcher from the Play Store, open it up, and select whatever app you want. Granted, your may or may not be able to actually use an app designed for a touch screen with a remote, so keep that in mind. Certain apps like Netflix and Kodi are exactly how’d you’d expect on any platform. They run well, and are full featured. YouTube on the other hand is disappointing. It lacks any sort of Picture in Picture mode (even phones support it now, come on Google) which makes watching while browsing impossible. You also can’t add or remove videos to playlist, which means frequent watch later users like myself, have to take out another device to use this essential feature. So I don’t have a lot of games on Android, and of the ones I do, none of them are designed for Android TV (Not that they don’t exist, have to recommend Knights of the Old Republic, one of my all time favorites). But after sideloading several, I was pleasantly surprised to see controller support is pretty good amongst titles, which made playing Android games totally doable on a couch (your mileage may vary). The gaming opportunity that really appeals to me, is taking advantage of emulators. Both RetroArch (can emulate a ton of older consoles) and Dolphin (designed for GameCube and Wii emulation) are available of the Play Store. RetroArch can be a little weird to set up, but once going I could play NES, SNES, N64, and GBA games without any issues. Dolphin has a much easier set up process, but the GameCube games seemed to be hit or miss at working (my shield couldn’t handle Wii games). The ones that did load seemed to run pretty well. The main issue seemed to be a dip in frames while loading areas. They put out builds several times a day (which is absolutely insane) so it’s possible I just grabbed a bad one. Google Cast allows you to stream a ton of apps to your Android TV. All you need to do is tap the cast button on a compatible app and the video/song/podcast will stream to your TV. It’s really seamless, and you don’t need to install anything on your Android TV. It works the same way as a Chromecast. I did occasionally have issues being able to cast from my phone to my Shield, but that was rare. I have had similar issues with Chromecasts in the past, so I don’t think it has anything to do with the TV. I do wish you could switch from a casted app to the full fledged one. It’s annoying to be watching something and pick up the remote to realize you can’t fast forward or pick a new video without going to your phone. One neat thing about Android TV is that they don’t have as big an issue with fragmentation as other Android devices. In fact, my Shield is the only device I have with 7.0, which is both nice and a little unfortunate. Part of that is attributed to the limited amount of customization manufactures can add (usually some extra apps). The other part is probably because there’s only a few Android TV devices to be fragmented. So unfortunately, there aren’t a whole lot of options, or price ranges. The search on the homepage is pretty good. You can type or use your voice to get information about movies, TV shows, or just anything else you’d like. It will show related movies, actors, and where you can buy/watch what you searched. I found that the results are not all inclusive. For example, when I searched for Kung Fury, a movie on both YouTube and Netflix, it only showed up as being on Netflix. So I haven’t tried watching any sort of live TV on it. You can hook up a antenna and tuner, but I have neither to test and prefer on demand services anyway. For another option for media, you can stream anything you’ve stored in a NAS to your Android TV. You can also set it up as a Plex server, to let you stream content you have downloaded to other devices. I don’t have the service, but thought I should mention it anyway. I like Android TV. It makes it easy for me to watch what I want on my TV. But it feels like it lacks the attention it needs to become the TV platform of choice. Apps could be improved, there could be better game support, and the whole experience could stand a little more user customizability. When it comes down to it though, it is a solid platform that I’ve been enjoying on a daily basis.